When did you first become interested in issues of translation philosophy? My Interest has been marked by two key moments along the way. The first came at the time of the release of the NIV, when I was asked to write a literary review of the new translation for Christianity Today. That assignment just happened to coincide with the appearance of a book of essays that criticized modern translations (chiefly the RSV and New English Bible) as being inferior to the KJV. Although I was only vaguely aware of how translation philosophy entered that debate, I became semi-expert in the deficiencies of modern translations. 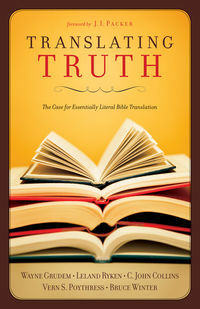 After serving as a member of the translation committee that produced the ESV, I asked Lane Dennis if he wanted me to expand my review of the NIV into a book-length exploration of the issues surrounding the rival translation philosophies. Lane surprised me by saying yes, so that was followed by my immersion in the subject of the opposed philosophies known as dynamic equivalence and essentially literal translation. The learning curve was steep, but very rewarding. I can imagine that some experts in the Bible in its original languages find it frustrating that an amateur like me has authored books on Bible translation. However, I was struck by the verdict of a New Testament scholar who had initially been skeptical of my authoring a book on Bible translation, but who said after reading my book that only an outsider to the guild could have written such a book. What are the two main translation philosophies, and how do they differ? Although the label essentially literal is a recent coinage, until the middle of the twentieth century the goal of English Bible translation was to find the English words that most closely correspond to the meaning of the words of the biblical text in its original languages. The goal was to find the verbal equivalent of the original text. Adherents of "dynamic equivalence" (and the more recent label "functional equivalence") do not necessarily feel obliged to translate the actual words of the original. 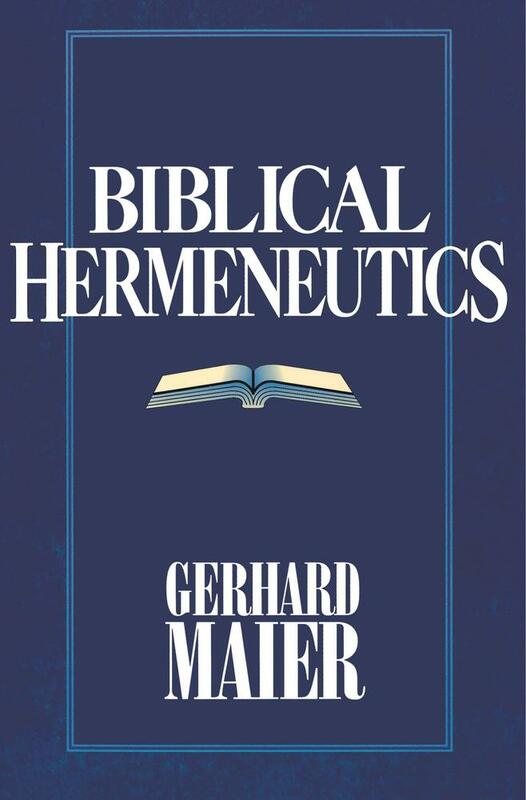 Instead, these translators often engage in commentary on the biblical text instead of translation of it. This is done by bypassing the words of the original and offering an interpretation of its "content meaning" as distinct from its "lexical meaning." 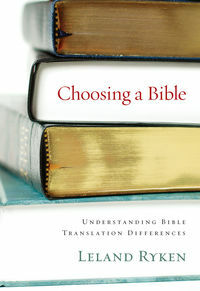 Provides a clear path through the maze of English Bible translations, defining the issues, contrasting the main traditions of modern Bible translation, and making a strong case for an essentially literal translation approach. 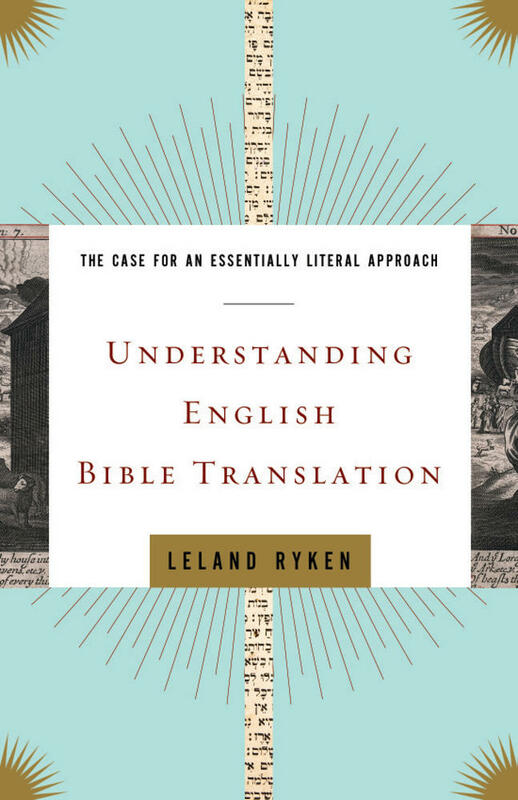 In my new book, Understanding English Bible Translation, I stress that the terminology of dynamic equivalence is misleading in covering the range of practices followed by translators. "Essentially literal" translation teams adhere to the following practices in addition to seeking to reproduce in English the actual words of the original: (1) they produce a dignified text that belongs to standard formal English; (2) they preserve the literary effects of the original, including metaphors and figures of speech; (3) they retain multiple or ambiguous references contained in the original text; (4) they create a rhythmically smooth flow of language; (5) they preserve the qualities of the biblical text that are rooted in the ancient world that produced only the Bible. Only a relatively small quantity of what we find in a dynamic equivalent translation consists of finding an equivalent in modern life for a detail in the ancient biblical text. The following list of methods employed by dynamic equivalent translators gives a more accurate picture of what these translators do: (1) they produce a colloquial Bible that sounds like the informal oral speech of the dormitory and bus stop (but not the written speech of the newspaper and Newsweek); (2) they do not place a priority on preserving the literary qualities of the Bible; (3) they often remove figurative language from sight and replace it with an interpretation of it; (4) they often remove ambiguous references from the biblical text by making a preemptive choice of one meaning from the list of possible meanings; (5) they make the Bible seem like a modern book rather than an ancient book. 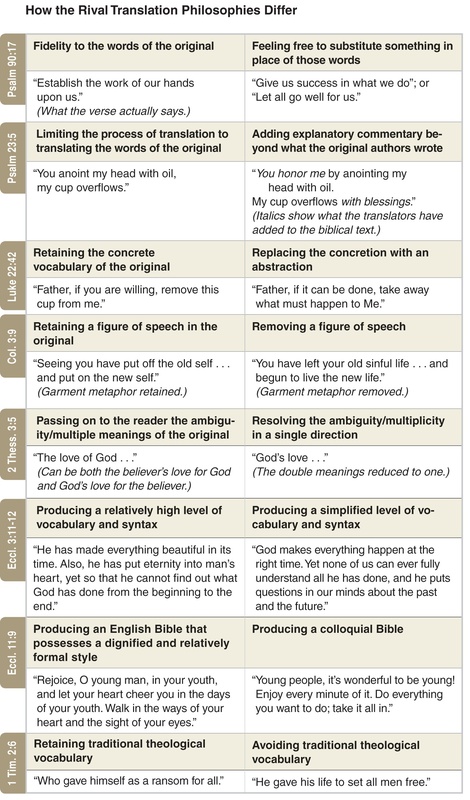 The chart below exemplifies the differences in translation philosophy (adapted from pg 33). I object because it is a misleading statement and it should be challenged every time it is put on the table in the public forum. There are different types or levels of interpretation, and this gets lost in the statement that all translation is interpretation. All translation is lexical interpretation, and that is all that can be accurately said about "all" translation. All translation is the translator's interpretation of what English word or phrase best captures the meaning of the equivalent word in the original text. The other kind of interpretation is what we call exegesis and commentary. It offers an interpretation of the meaning of a text—not usually an individual word, as in lexical interpretation, but meaning of the broader content of an utterance. 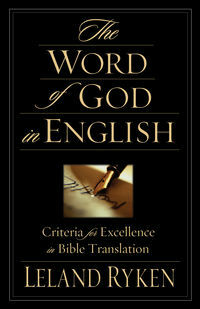 For example, to render Psalm 23:5a as "you anoint my head with oil" is a lexical decision as to what English words are the verbal equivalent of the words of the original. But when a dynamic equivalent translation renders that verse as "you welcome me as an honored guest," we have moved beyond lexical interpretation to commentary. The reason dynamic equivalent translators love the formula "all translation is interpretation" is that it makes their practice seem normal. The implication is that dynamic equivalence is no different from the procedure of essentially literal translators. In fact the difference between the two translation philosophies is not a difference of degree but of kind. Join us back here tomorrow for the second segment of our interview with Leland Ryken.